In Alberta, Canada, child care is a responsibility of the Ministry of Human Services while the Ministry of Education is responsible for Early Childhood Services including kindergarten. The province’s approach to early learning education and care flows from the Canadian Government’s multilateral framework. 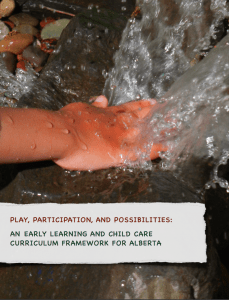 Play, Participation, and Possibilities – An Early Learning and Childcare Curriculum Framework for Alberta is the key document for the early learning sector in this Canadian province. Download it here. Issued in 2014, the 273-page framework uses the curriculum framework goals of New Brunswick. Those goals are holistic and mean that academics and educators have a “new and common language” in their use of and discussion of the framework. It covers center and home based childcare for children aged from zero to five. Starting with the image of the child as a “mighty learner and citizen”, educators are seen as “co-learners, co-researchers and co-imaginers of possibilities along children and their families and with/in community”. Everything children do has meaning for them, says the framework. There are four holistic play-based goals: well-being; play and playfulness; communication and literacies; diversity and social responsibility. Educators are encouraged to use those goals to reflect on and interpret the experiences of early learners. The framework clearly unpacks these goals, drawing out questions such as ‘what does it mean’ so educators can reflect and interpret, then suggesting possible next steps for planning and taking action. For more information about documentation including for learning stories, visit the www.childcareframework.com, from Fall 2018. The framework does not address curriculum making in First Nations, Métis and Inuit communities. It lays responsibility with those communities to develop “critical leadership” and dedicated resources to bridge this gap. However, a 2002 report, The First Nations, Metis and Inuit Education Policy Framework, is still available via the second end note in this profile of ECEC trends from 2011-2017. The Canadian government announced in early 2018, it was working on a separate Indigenous Early Learning and Child Care Framework. The Guide to Education: ECS to Grade 12 2017-2018 also covers the policy framework for the early education and childcare sector in Alberta. The Early Services Regulation spells out what early childhood services need to do legally including safety standards, programs, policies, record keeping, financial reporting and insurance. The Alberta Association for the Accreditation of Early Learning and Care Services represents the government in providing accreditation services for licensed day care centres, approved family day home agencies and licensed out-of-school care programs in Alberta. It has oversight of the sector. The association also monitors continuous quality improvement. Childcare accreditation covers care of children aged up to 12. It’s a voluntary process and there are six accreditation standards, which were last revised in September 2017. For more information, see the Alberta Childcare Accreditation Evaluation and Scoring Framework here, which is aligned to the accreditation standards. Ten Child and Family Services Authorities offices and 18 Delegated First Nation Agencies share the monitoring and licensing of regulated child care operators in Alberta. The Alberta Government started a three-year pilot in 2016 to offer childcare at a $25 a day maximum for children aged to six years. In April, 2018, the Alberta Government pledged to inject $136 million in the early learning sector over the next three years. The funds will help open 78 new early learning and childcare centres and help parents with rising childcare costs. The Association of Early Childhood Educators issued its detailed report, Qualified Educators, Quality Care, in May 2018. It sets down a ten-year plan to transform the early learning and childcare workforce into a profession. The association aims to do this through leadership and planning, advocacy, system building, professional learning and support as well as communication and public relations. The report found that childcare spaces and qualified educators were in short supply, costs were prohibitive for many families and educators were poorly paid.